"It was great to breakfast from 6am. Good location to start the Camino." The Hotel Villa de Sarria features 28 rooms, and it’s located in one of the most famous villages for it’s one of the main points of the Way of St. James. It’s 5 minutes away from the city’s downtown, and it’s very well communicated by the highway A-6. It’s a familiar and cheap hotel, and its rooms feature a bathroom, hairdryer, a TV, heating, air conditioning, telephone, piped music and a safety box. On top of that, it has a bar, a 24-hour front-desk, newspapers, a terrace, rooms for non-smoking people, rooms for disabled people, and lift. It also has a parking for cars and bikes, and a luggage pick-up service. A 31 km from Lugo Orense direction by the C546. La Villa de Sarria, known for their privileges in the way of French Santiago.El step on the Camino de Santiago by the municipality has led to numerous ecclesiastical buildings in this area, as with its medieval legacy to us left several samples of military and civil architecture. Step of the Way of Santiago by the municipality has led to numerous ecclesiastical buildings in this area, as with its medieval legacy which has left us many examples of civil and military architecture. Reservation may be cancelled or amended up to 24 hours prior to day of arrival of the client, exept on Easter and August that will be with 72 hours notice and from the 8th to the 14th of June that will be with 7 days notice. Failure to cancel your booking prior to this time will result in a charge of one night's accommodation apart from the initial guarantee deposit. In order to amend a reservation, please contact directly to the hotel which details figure in the voucher. If your amendment reduces the number of nights or rooms the deposit will not be refunded and will not be discounted of the modified reservation fee. "cheap and close to the old town (such as there was of it) and the city of the new town"
"very basic, with a barely adequate mattress and facilities in the room"
"The staff was incredibly helpful. I arrived early with a bummed knee from the Camino. They got me into the room early, provided me coffee while I waited, and assisted in any way possible to make the stay enjoyable. They even made suggestions and called to make an appointment at a local osteopath to work on my knee." "The rooms were adequate and clean but the walls are thin. We heard a person in a nearby room snoring in the middle of the night." 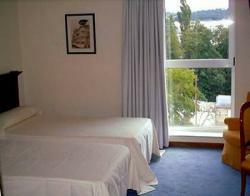 "Really noisy room near the lifts could not sleep in even if you wanted to. WiFi didn't work on. Level 5 intermittent connection in reception very frustrating when trying to book for next location."